On my recent trip to the Savage, I filmed quite a bit of footage on the river that I couldn’t fit into the last video post. I also hiked up a brookie stream and took some pictures that didn’t make it into the recent report. As the picture above illustrates, this drop on a small stream was a decent waterfall at the higher levels I encountered. I planned to return later in the week to this stream, but I never hiked in again since levels dropped quickly on the Savage. The number and size of brookies I was catching on the Savage was one of the reasons I stayed there all week. I caught a few small brook trout, but most were eight inches and larger. The Savage was still flowing very high the first day, yet I spotted an eleven inch brookie working the surface. This trout was aggressively feeding, although the brookie appeared very selective. 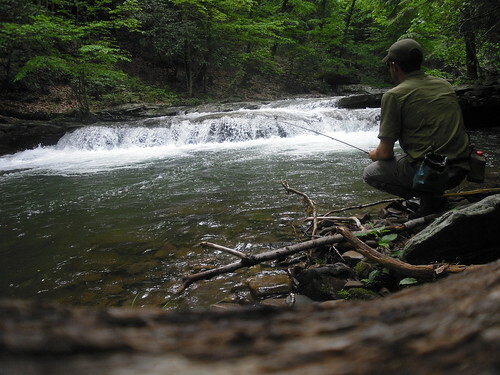 I never made a cast over the fish, yet the trout’s body language exuded an ultra finicky nature. The trout was frequently scanning the surface left and right, often rising a foot before refusing debris, or unwanted insects. The latest video post features a nice size native brook trout I left feeding in the crystal clear water of the Savage River in Western Maryland. This entry was posted in fishing report, video on June 1, 2010 by Jason du Pont.